Total existing home sales were up in December when compared to the previous month and were also up from December of last year. Prices continue to increase, even given the modest seasonal decrease that is typically seen in the winter months. This is due in large part to the consistent rise in home sales, coupled with the continually decreasing inventory. Demand is there, but many buyers are finding it hard to find what they’re looking for. Recent Federal Reserve policy changes will likely mean slightly higher interest rates moving into the New Year; however, market reactions so far have been positive and rates have edged up very slowly. NAR economists are predicting 5% interest rates by the Spring or Summer of 2014 but there are many variables to consider so we will have to wait and see. Those considering purchasing a home may wish to take advantage of the modest price gains and lock in mortgage rates as they continue to trend upward. **Month’s supply over 6 months is said to favor buyers, month’s supply below 6 months is said to favor sellers, and month’s supply of 5-6 months is said to be a balanced market. In December, the Federal Reserve announced it would begin to curtail its purchases of non-traditional assets, also known as quantitative easing. As the Fed tentatively draws back its level of asset purchases, mortgage rates will likely continue to slowly increase. 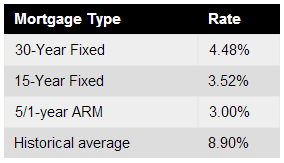 Currently, Freddie Mac reports the following, figures: 30-year fixed-rate, 4.48%; 15 – year fixed-rate, 3.52%; 5/1- year adjustable rate, 3.00%. According to the Long Island Board of Realtors, the seasonally adjusted rate of home sales increased 6.9% from last year to an annual rate of 773 homes. The rate of home sales is also up 5.2% from the rate reported in November. As banks begin to implement new lending regulations, credit tightness is likely to hamper home sales in Queens, however, due to the fact that inventory is still shrinking, demand is growing and may continue to do so in the beginning of the New Year. Median home prices rose slightly from November to December, rising 1.3% from $380,000 to $385,000 according to LIBOR. Year-over-year home prices continue to show fairly modest gains with prices up 2.7% from last December. This is consistent with the price gains of 2.4% over the course of the last twelve months. The level of total housing inventory in Queens county dropped in December to 5,190 homes, down 9.3% from the previous month. Month’s of supply of inventory also dropped slightly due to the high pace of sales this month. The number of months of supply represents how many months it would take the current level of inventory to sell given the current sales pace if no other homes were added to the market. Supply in December represented 6.3 months, down 8.7% from the previous month. A sign that demand is very high and inventory is still scarce in many areas around Queens. Courtesy of George Herrera with the Queens Home Team @ Keller Williams Realty Landmark II.